We are delighted to have been invited back to Ilchester Place, where our most recent project was completed four years ago. It is always a pleasure to work on this street in the heart of Holland Park, where the handsome facades of the houses demand a formal response. On this occasion we have elected to fill the front garden with four multi-stemmed Cercis siliquastrum ‘Alba’, an unusual white form of the Judas tree that produces an abundance of flowers on bare stems in May. We will plant an understorey of yew (Taxus baccata) and sweet box (Sarcoccoca confusa) clipping them into cubes of different sizes to cluster around the stems of the trees, so that our clients will be welcomed home by the gorgeous scent of the sweet box in Winter. The area behind the house will be a secret garden, an intimate and private space, utterly enclosed by an aerial screen of pleached holm oaks (Quercus ilex). We will plant a yew hedge to run like a green ribbon between the bare stems of the trees, interrupted it only by two elegant stone benches on either side of the lawn. 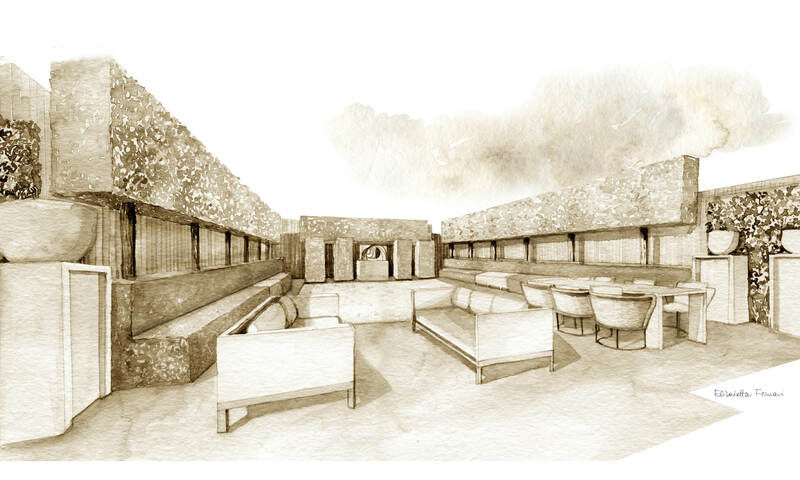 The new garden will be a refreshingly green space in the heart of London, and an appropriately modern table and chairs will make it a perfect venue for al fresco dining. The view from the table will be stopped by a dramatic sculpture set against a backdrop of hedges and trees and framed by two yew columns.